Daru Jones is one of the most respected drummers of his generation. Born to two professional musicians, he began playing the drums at the age of four. Though he got his start in the church, Jones has been influenced by musicians from a wide range of genres. These eclectic musical tastes have carried over into his own career as he has recorded, performed, and toured with renowned artists and producers such as: Jack White, Slum Village, Talib Kweli, Black Milk, Dwight Yoakam, Jamie Lidell, Pete Rock, Salaam Remi, Gloria Gaynor, Kim Burrell, Rance Allen, Black Violin, Ski Beatz & The Sensei’s, Lorenzo Jovanotti and Jon B (partial list). Alongside these artists, Jones has graced the stages of some of the most revered events in the music industry, including: One Mic: Hip-Hop Culture Worldwide! A 20th anniversary celebration of Nas debut album Illmatic, the 2013 Grammy Awards, Austin City Limits, Rock The Bells Festival, and the Montreux Jazz Festival. Receiving rave reviews from: Rolling Stone Magazine, LA Weekly,and USA Today (partial list), he has also appeared on several national and international television programs: The David Letterman Show, Jools Holland (UK), The Colbert Report, Saturday Night Live, and MTV.Jones has been the “go-to-drummer” in the hip hop game for over a decade. He has shared the stage with legends and emerging stars alike, including: Black Moon, Smif N Wessun, Q-Tip, Mos Def, Raekwon, Curren$y, Pharoahe Monch, Jean Grae, Black Sheep, Digable Planets, Camp_Lo, Smoke Dza, Theophulis London and Large Professor. 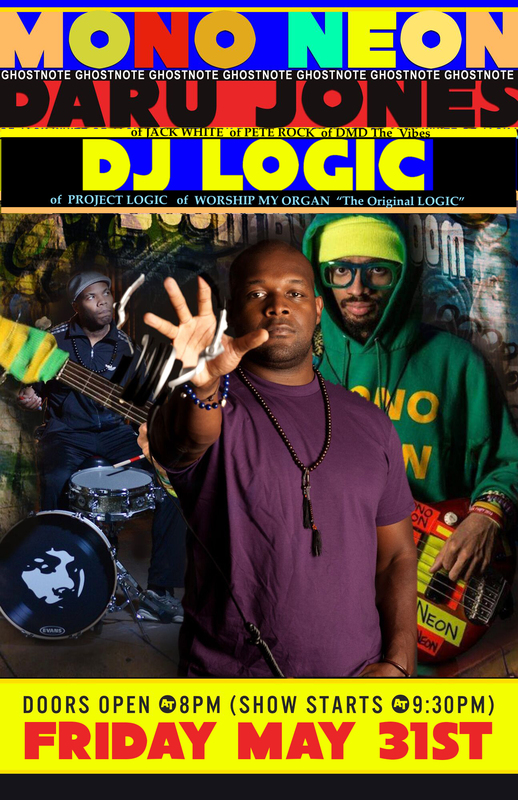 DJ Logic is an American turntablist active primarily in nu-jazz/acid jazz and with jam bands. Kibler was born and raised in The Bronx. An early interest in hip hop led to his using the turntables, practicing often. Kibler was also interested in funk and jazz music, and began collaborating with various musicians. “The theorem of turntablist as musician has been long proven in the capable hands of DJ LOGIC, whom with jazz as his foundation has become a wax innovator by crossing genres and mixing his sound across the map. As one of the world’s most accomplished turntablist’s, DJ LOGIC is widely credited for introducing jazz into the hip – hop realms and is considered by most as a highly respected session musician and an innovative bandleader. DJ LOGIC and his role as an electronic-music ambassador keeps him at the top of his game. Whether the scratch artist instructs tablas to flirt with drum ‘n’ bass (such as on his NINA SIMONE and BILLY HOLIDAY remixes found on Sony Legacy’s Remixed and Reimagined volumes) , or while meshing free styling MC’s with Afro-Cuban rhythms (such as on ‘Share Worldwide Funk’ – a remix produced for JACK DeJOHNETTE and Golden Beams Collected, Volume 1 ) , LOGIC can always be found paying homage to his predecessors while contributing his vision to the deejay genre. While the context of his work may vary, DJ LOGIC’S spinning skills are definitely beyond reproach. He works with a phenomenal roster of invited guests, and he knows how to pick his collaborators as well as his samples. With a growing catalogue of recordings under his belt, DJ LOGIC’S supreme musicianship and catholic tastes will allow him to journey wherever an infectious groove may take him.